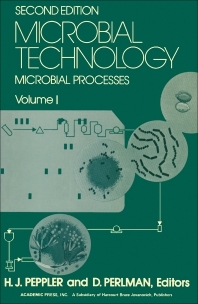 Microbial Technology: Microbial Processes, Volume 1, describes the production and uses of economic bacteria, yeast, molds, and viruses, and reviews the technologies associated with products of microbial metabolism. It is part of a two-volume set that emerged from a worldwide survey of industrial microbiology and its contributions to agriculture, industry, medicine, and environmental control. The book contains 17 chapters that cover the development of bioinsecticides and the large-scale bioprocessing of concentrated lactic acid bacteria with emphasis on the commercial use of the resulting culture. It includes discussions of the production of single-cell protein for use in food or feed; production of yeasts and yeast products; production of butanol-acetone by fermentation; microbial production of amino acids; microbial production of antibiotics; production of microbial enzymes; microbial production of nucleosides; and production of organic acids by fermentation nucleotides. The remaining chapters cover plant cell suspension cultures and their biosynthetic potential; polysaccharides; microbial transformation of steroids and sterols; the production of vitamin B12; microbial process for riboflavin production; and the production of carotenoids.